Water skiing is an exciting sport; but like all sports, it comes with a lot of risks. At speeds of up to 50 mph, water skiers must be extremely aware of other boats, swimmers, and any obstacle, which can cause them to lose balance and crash into the water. Injuries happen a lot more often than expected when an operator fails to make sure that a water skier has the proper experience and safety equipment and is capable of making a responsible judgment on the water. Operators of water ski tow boats carry a lot of responsibility when it comes to safety. If you are injured in a water ski accident that was not your fault, contact the expert San Diego water ski injury attorneys immediately to get compensation. Water Ski Injuries Can Happen When an Operator Fails to Make Sure that a Water Skier has the Proper Experience and Safety Equipment and is Capable of Making Responsible Judgment on the Water. 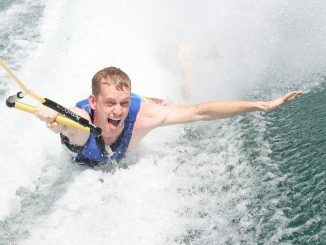 Waterskiing, in particular, has been growing in popularity in recent years in San Diego amongst the water sports. Though, with only one lake in San Diego offering the sport-El Capitan- waterways tend to get crowded and therefore very dangerous for water skiers. It is no surprise that water ski injuries have steadily increased throughout the years. As with other boating and water sports, there are both federal and state laws that regulate water skiing. The American Water Ski Association (AWSA) law, as well as California law, requires there to be a least two persons aboard a boat towing a water skier: the operator, and an observer 12 years of age or older. Be alert for anything that may come between you and the boat, i.e. cross-wakes, swimmers, rafters, etc. Boat operators must be extremely cautious when pulling a water skier. A skier’s safety falls into their hands. They are responsible for checking for a clear path, freeing the towline, accelerating at a steady speed, and making safe turns. When a skier falls, boat operators must return immediately. Shut the engine off so the skier is not in danger from the propeller and approach with caution on the side of the boat. Observer In addition to relaying the signals back-and-forth from the skier and the boat operator, the observer is responsible for watching the skier at all times. Statewide boating accident statistics indicate an alarming increase in water-ski accidents resulting from improper lookout. Maintain a reasonable, safe speed at all times. If you are “dropping a ski,” release it near a dock where it can be retrieved immediately out of the way of other boats and skiers. If you are the skier, learn the proper hand signals for communicating with the boat operator. Water skiing is an extremely dangerous sport, especially for someone who is inexperienced and unfamiliar with proper procedure. Water skiers can be injured by boat hardware and emissions, ski equipment, obstacles, or collisions with other vessels. If you or someone you know was injured or killed in a water skiing accident in San Diego due to someone else’s negligence, you are entitled to money damages. Contact an experienced water skiing injury attorney immediately. Our lawyers will help you get the compensation you need to cover your medical costs and lost wages.